On 19 May 2012, the Press published an article about the rescue of art and paintings from the Government Life Building in Cathedral Square. Attached is a photograph of one of the paintings, which was recently on show in a Wellington art gallery. I bought this painting because in it I see very strong associations with the Canterbury earthquakes. As a consulting engineer specialising in earthquake engineering, I was a member of the Canterbury Earthquake Recovery Commission following the earthquake of 4 September 2010. Immediately following the devastating earthquake on 22 February 2011 I spent several weeks in Christchurch helping to lead teams of structural engineers who were assessing tall damaged buildings and devising ways of stabilising them. These buildings included the Hotel Grand Chancellor, the Copthorne Hotel on Durham St and the Government Life Building. This ‘Critical Buildings Team’ appraised over 40 buildings of six or more storeys. A few days into this activity, I learnt that Christchurch artist, Marie Le Lievre, had many of her paintings trapped in the Government Life Building and that some of her colleagues similarly had left important works behind in their terrifying rush to escape. By coincidence, on that same day, the building owner came to the Critical Buildings Team office in the Christchurch Art Gallery. On hearing of Marie’s concern, the owner immediately promised to contact her if and when an opportunity arose to rescue the paintings. His genuine concern and willingness to help were most impressive, given that he was the owner of several major buildings in the CBD that had been seriously damaged. It was several months before the paintings could be rescued, but Philip Carter kept in touch with Marie and the other artists so they could be present when the opportunity finally came to recover the works. Marie, who is my niece, was in the photograph published in the Press on 19 May. To my earthquake-centric mind the two groups of circles in the painting resemble shaking intensity maps which are used by seismologists and engineers to describe the effects of earthquakes. The right hand group of circles represents the Darfield earthquake of 4 September 2010 and the left hand group represents the Lyttelton aftershock of 22 February 2011. It is as though this part of Canterbury is being viewed from above and from the north. The overall darkness of the colours speaks of the huge overall impact of the earthquakes on Christchurch and Canterbury. It was a dark day for many. The dark brown and black colours represent the widespread liquefaction that caused severe damage to buildings and infrastructure, and disrupted so many lives. These colours link the two groups as a reminder that liquefaction occurred not only in these two earthquakes but in many aftershocks. 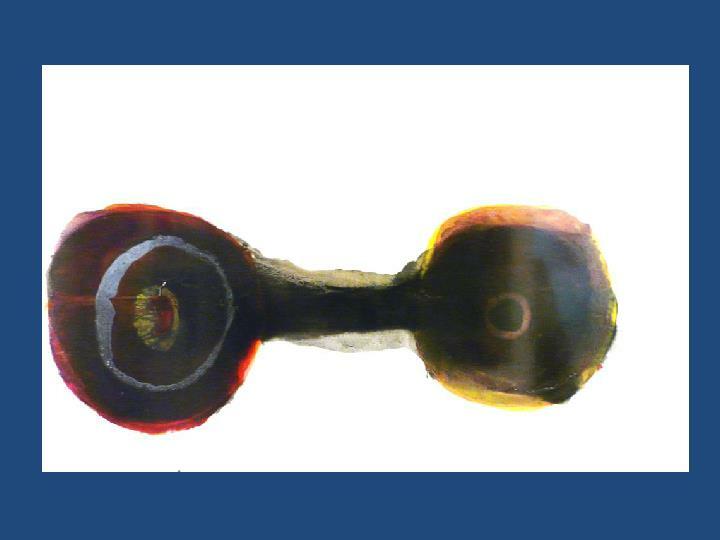 The light brown colour and shapes between the two ‘targets’ are reminiscent of the Port Hills. This calls to mind the landslips and rock falls that caused such extensive damage to homes and sections – and forced many people and families to move elsewhere. The inclusion of red at the centre and throughout the left ‘target’ is a reminder that 185 people died in the Lyttelton aftershock and that many more were injured. The light background tells of the positive spirit of the people of Canterbury and the fact that even the huge devastation and disruption caused will not dampen it. As if to emphasise this Canterbury spirit, there are alternating red and black colours in the left group of circles. For me, the painting is also a reminder of the incredible contribution of engineers and building officials in response to the 22 February earthquake. They dropped what they were doing and came from far and wide to assess thousands of buildings that had been damaged all over Canterbury in a matter of seconds. The commitment, courage and skills shown by these professionals were simply outstanding. It was a rare privilege to be part of such an effort. Moving Target is a fitting name. 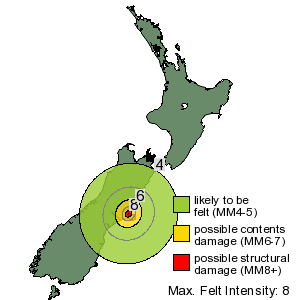 The target is Christchurch City and Canterbury which have been shaken by thousands of aftershocks since 4 September 2010. The epicentres of these aftershocks have varied widely in their location. Plotted on a map they look like moving targets. The many people who have been forced to move within or beyond of Canterbury as a result of the earthquakes may well consider themselves as moving targets. Overall, the painting provides a reminder of the worst of destruction and disruption that the earthquakes have brought, and of the best of human responses in the days, weeks, months and years that have followed. Magnitude 6.3, Tuesday, February 22 2011 at 12:51 pm (NZDT), 10 km south-east of Christchurch. 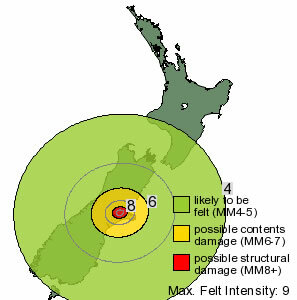 Magnitude 7.1, Saturday, September 4 2010 at 4:35 am (NZST), 40 km west of Christchurch.